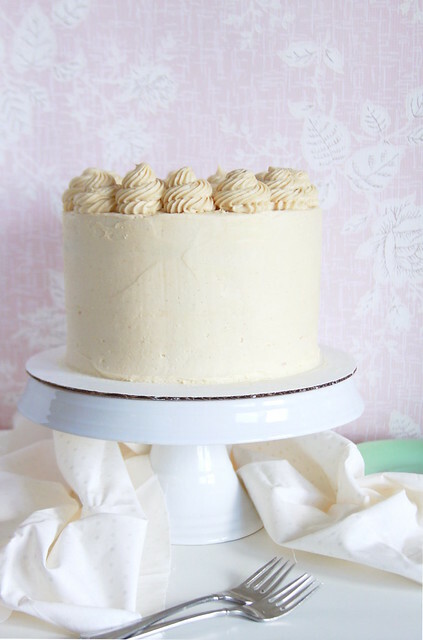 This J Peterman Cake is the ultimate standard for vanilla cake with a satiny smooth frosting! I want a J Peterman life. There’s seduction of eyes met from across the room, portfolios and bonds, weekends hunting upstate with the basset hounds, spur of the moment trips to the Maldives or Marrakesh. You don’t need to be on trend. You’re not in the short term competition to be en vogue. You’re an everlasting, unfaltering classic that watches the fads fight it out below. Paleo? Raw? Gluten Free? As a set ideal standard, you don’t need to worry about fuss. Your are the portion control master. You are the person who drinks heavy cream in coffee each morning and still has an Audrey Hepburn waist. To say the least, I love pouring over the descriptions in these catalogs. You don’t need pictures for the clothing, these people can afford to drop money on the mere illustrations. This cake represents the J Peterman life style. 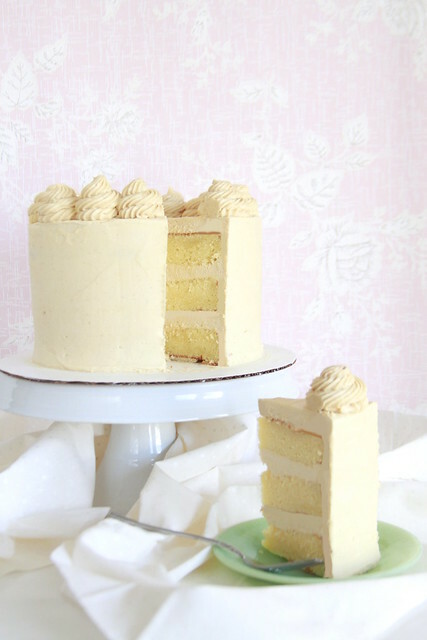 A classic vanilla cake. In the cake world, it seems as if vanilla cake is the most elusive. It’s an obvious flavor, but oh-so easy to screw up. It’s hard baking the right one. Vanilla cake has to be moist without being dense, as well as fluffy without being rubbery. I’ve made many vanilla cakes, but this one is different. Here the J Peterman Cake combines the richness of an egg yolk cake with the levity of an egg white cake. Combining different fats and different flours makes for a cake texture that’s universally appealing. Again one fat is never enough. For the frosting a combination of butter, cream cheese, and sour cream make with a texture that scream luxuriousness. It’s the Cadillac of buttercream frostings. 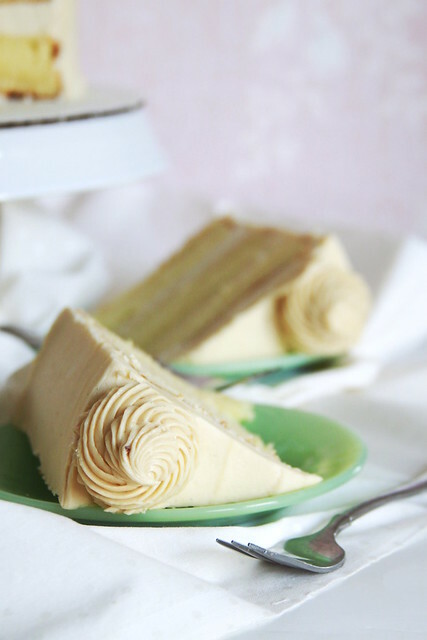 The frosting for this J Peterman Cake is full of fat and makes no apologies. The J Peterman Cake sets a standard and raises the bar and remains a timeless classic. Preheat oven to 350 degrees F. Grease three 8-inch cake pans with baking spray, set aside. In a stand mixer fitted with a whisk attachment whip egg whites on medium-high speed until soft peaks form. Lower speed to gradually add ¼ cup granulated sugar, and raise whipping until stiff peaks form. Transfer to another bowl and clean the mixer's bowl. In the now clean bowl of the stand mixer whisk together remaining sugar, flours, baking power, salt, and baking soda. Fit mixer with a paddle attachment. Add cubed butter and oil and turn mixer on low to incorporate the fats into the dry ingredients, about 3 minutes on medium speed. Scrape down bowl, add sour cream and beat for 2 more minutes. In the meantime whisk egg yolks, buttermilk, and vanilla together. With mixer on low add the egg mixture in two batches, beating 1 minute after each addition. Give the bowl and paddle a scrape. Stir ⅓ of the beaten egg whites into batter, just to lighten it. Fold remaining egg whites ⅓ at a time into the batter. Divide batter between prepared pans and bake for 34 to 38 minutes, rotating halfway. The cakes will be golden on the top and will begin to shrink away from the pan. Let cakes cool in pan for 5 minutes before inverting onto a wire rack to cool completely. In a stand mixer fitted with a paddle attachment beat butter and cream cheese on medium-high speed until whipped, light and fluffy, about 3 minutes scraping the bowl and paddle periodically. Gradually add powdered sugar, salt, vanilla, and food gel on a low speed then raise speed to blend until smooth and lump free. Add sour cream at the end, beating to incorporate. Use a serrated knife to level off cake tops. Dollop a bit of frosting onto the cake board and secure the first cake layer. Apply an even layer of frosting and secure the next cake layer. Repeat process, topping with third and final layer. The frosting will be soft, so do a gentle crumb coat, refrigerating for 30 minutes to an hour. Do a final thicker coating. Use remaining frosting to pipe a boarder.